The local New York City media has devoted attention to the lawsuit and the subsequent Health Board and Parks Dept hearings. So far, most press coverage has been supportive to preserve Off-leash Hours policy. Dog Wars Unleashed, August 2, 2006. 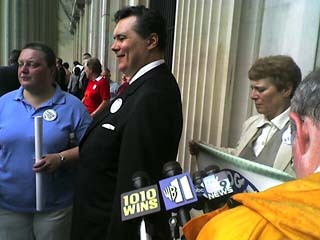 NYCdog representatives on the steps of the State Supreme Court in Queens on August 29, 2006 give a press conference while inside the courthouse, a judge hears oral arguments in the case that threatens to end Offleash Hours. Make sure to turn your speakers on! 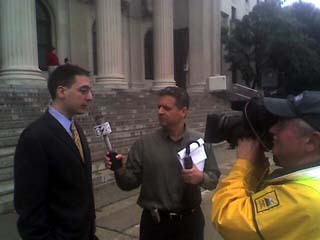 Matthew Greller, an attorney from the Law Firm of Blank, Rome, LLP was part of the pro bono legal team that represented NYCdog to support the NYC Parks Department in the Offleash Hours case. 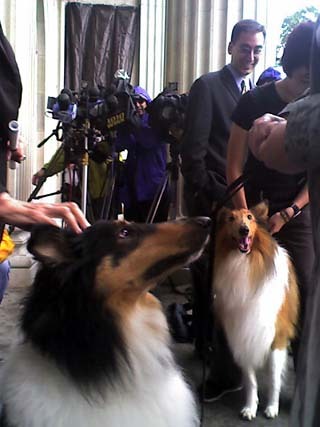 The Law Firm of Curtis, Mallet-Prevost, Colt & Mosle, LLP were the main pro bono attorneys that drafted NYCdog's Cross-Motion to Intervene in the Case on the side of Parks. A big thanks in particular to Andrew Otis and Dora Straus who represented NYCdog in front of Judge Peter J. Kelly on Aug. 29. 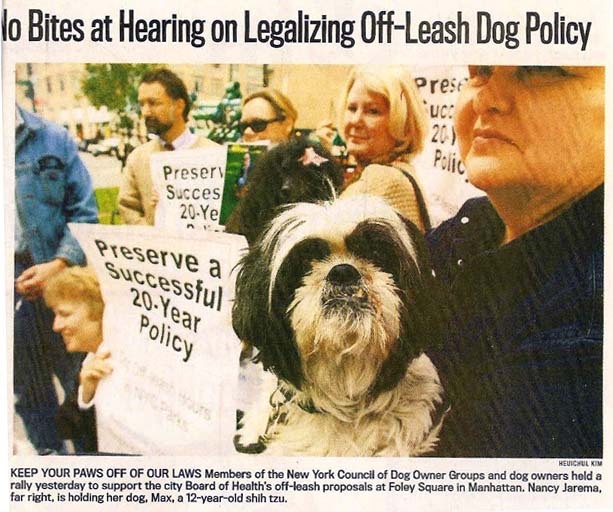 Press Clipping from a New York Sun article regarding a NYCdog Press Conference held November 1, 2006 in front of the NYC Health Department building prior to the Health Board Meeting to discuss amendments to the City's "Leash Law."